Society’s growing demand for high-energy-density power sources for electronics and electric vehicles cannot be easily satisfied with present lithium-ion intercalation technology, even if they are fully developed. Therefore, non-aqueous alkali metal-oxygen (AM-O2: AM = Li, Na, and so on) batteries offer promising alternatives to traditional lithium-ion battery because of their ultra-high theoretical energy density. Conversely, AM is highly reactive towards air and virtually all non-aqueous electrolytes, leading to considerable parasitic reactions. In addition, uncontrollable Na or Li metal stripping/plating, normally evolving as dendrites, easily causes a short circuit in cells and this is accompanied by explosion or fire events, thereby plaguing AM anodes towards useful applications. Hence, in order to obtain a stable and safe AM-O2 cell, it is essential to overcome the dendrite combined with corrosion/oxidation problems of AM anode. Now, for the first time, a team of researchers, headed by ZHANG Xinbo from the Changchun Institute of Applied Chemistry (CIAC), Chinese Academy of Sciences, YAN Junmin from Jilin University, and ZHANG Yu from Beihang University Beijing, has created a long-lasting AM-O2 battery using Li-Na eutectic alloy as new metal anode. The results of the study have been reported in Nature Chemistry. The team noticed that Na and Li of Li-Na alloy display analogous reaction activities, and hence both can be used as active components in batteries without compromising the specific capacity when compared to other types of alloys (for example, Na-Sn alloy). Moreover, alloying Na and Li not only enhances the metal’s corrosion resistance against electrolyte and O2 but also suppresses the growth of metal dendrites. Most significantly, in a Li-Na alloy battery, with the aid of electrolyte additive, the ensuing oxidation-resistant, dendrite-suppressed, and crack-free Li-Na alloy electrode imparts excellent performance to the newly-recommended aprotic bimetallic Li-Na alloy-O2 battery. In addition, by adding efficient O2 reduction/evolution catalysts (for example, Co/NCF), the rate capability and cycling life of Li-Na alloy-O2 battery are considerably enhanced. We believe that this strategy can also be applied to other metal electrodes, such as Zn, Mg, Ca, Al and so on. ZHANG Xinbo, Changchun Institute of Applied Chemistry (CIAC), Chinese Academy of Sciences. In the meantime, this research offers a guidance for creating other bimetal batteries, for example, bimetal-S batteries and bimetal ion batteries. 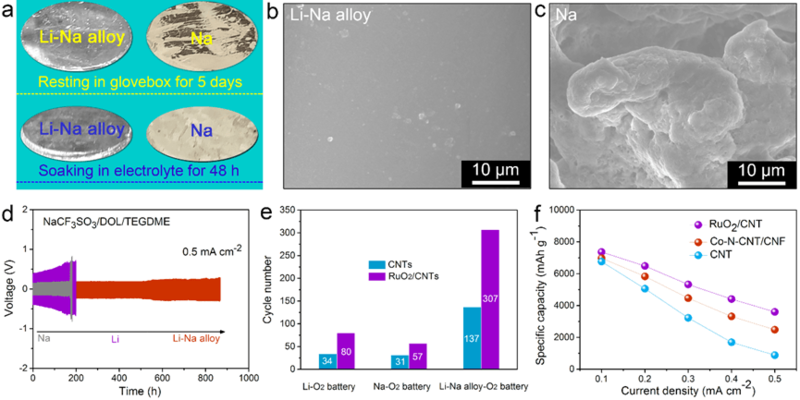 Such batteries have novel chemistries, display more improved electrochemical performance when compared to mono-metal batteries, and adopt combined technique to discharge the immense potential of alkali metal anode.